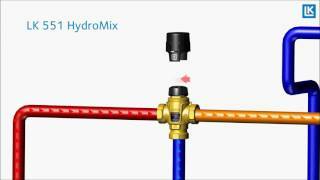 LK 551 HydroMix is a mixing valve for water heating and heating systems. The mixing valve has a thermostatic element that regulates the supply of cold as well as hot water in order to achieve the desired ­temperature. The valve has an anti-scald function that shuts off the ­incoming hot water flow in case of failure of cold water supply. The valve knob is used to set the desired warm water temperature within the specified range. The ­protective cap prevents unintentional changes of the ­temperature setting.